α1-antitrypsin (AAT) clearance in patient stool decreases during treatment. Blood levels of AAT remain largely unchanged but stool clearance decreases as intestinal complications are resolved. Allogeneic hematopoietic cell transfer (HCT) has provided durable cures to patients suffering from numerous hematopoietic diseases, yet graft-versus-host disease (GVHD) remains a serious complication of HCT. Despite HLA matching and immunosuppression, in 30-70% of HCT patients immune cells transferred from the donor mount a response against the patients own tissues. Treating or developing new therapies for GVHD requires a multifaceted approach. In the quest for new therapies we often emphasize why a novel treatment works, yet the therapeutic regimen (how and when the treatment takes place) is an enormous question that is also essential for the success of a therapy. In the case of GVHD three types of therapies exist, (1) prophylaxis, (2) treating acute or (3) chronic GVHD. To complicate matters further frontline and backup therapies may exist. Acute GVHD is treated initially with steroids, yet a secondary therapy is required in 60% of patients that do not respond. Finding the best niche for a new therapy can be difficult. However, preclinical work from the Deeg Lab in the Clinical Research Division found that a new therapy, α1-antitrypsin (AAT) may fill multiple needs for GVHD patients. The first clinical step for AAT treatment was a phase I trial as a secondary therapy for steroid-refractory acute GVHD patients. The findings from this trial were recently published in Biology of Blood and Marrow Transplantation. AAT is a serine protease inhibitor naturally produced in humans as an anti-inflammatory agent. AAT treatment in mice with GVHD reduced expression of inflammatory cytokines and clinical features of GVHD; moreover, it has been safely used in patients with type 1 diabetes and myocardial infarction. This safety profile in humans made AAT an exciting possibility for GVHD therapy, but had to be validated in HCT patients since they are commonly immunosuppressed. For this study, doctors chose to test AAT on patients with the greatest clinical need  acute GVHD patients for whom steroid treatment was ineffective. While this study is ongoing, the recent publication documented the results from 12 patients isolated into two cohorts. Qualifying patients had undergone allogeneic (cells from a donor) HCT using a diverse set of conditioning regimens and stem cell sources, all exhibited acute GVHD, and showed no clinical response to methylprednisolone treatment. Patients were segregated into two cohorts based on dosing; both cohorts received an initial 90 mg/kg loading dose of AAT and unique maintenance doses every other day for two weeks  30 and 60 mg/kg for cohorts one and two respectively. None of the 12 patients exhibited toxicity on the study, consistent with AAT treatment in patients with diabetes and heart disease. Ten patients completed all treatment doses and two patients discontinued the therapy due to lack of clinical efficacy. While it is difficult to make efficacy determinations from small studies, eight patients demonstrated clinical response with AAT using criteria defined by the Center for International Blood and Marrow Transplant Research. Excitingly, four of the responding patients experienced a complete response. Partial or complete responses largely resolved intestinal complications associated with GVHD in these patients. This meant patients no longer required IV nutrition and improved intestinal integrity as evidenced by >50% reduction in stool volume. Ultimately six patients were surviving 134 to 850 days after HCT, while six patients died (in all cases GVHD was a contributing factor). While clinical studies determine patient safety and response, a well-designed study can also provide important knowledge about human biology and improve a therapy. In this study researchers collected blood and stool samples in order to measure molecular changes caused by AAT therapy. One of the first measures was to detect AAT levels in blood and stool. AAT is normally produced, but in GVHD patients the intestinal complications render AAT largely ineffective because it is cleared in stool. Surprisingly, despite the large AAT doses given to patients, blood levels remain fairly consistent and stool levels decrease as intestinal GVHD symptoms are resolved. One hypothesis is that AAT homeostasis is tightly controlled, "AAT plasma half life is not short, and therefore, there are very likely regulatory responses like a rheostat. The endogenous production of AAT is upregulated with inflammation and will be reduced on the therapy." said Dr. Joachim Deeg. These safety and suggestion of efficacy observed in this study has doctors optimistic about AAT, but they are still determining which patients it will work best in. 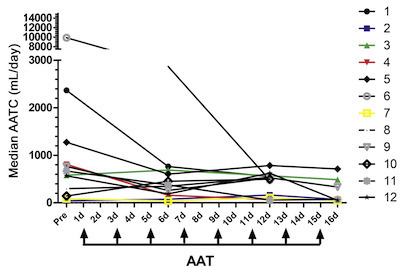 Preclinical work at Fred Hutch and other institutes demonstrated that AAT may work not just as a salvage therapy, "We, and a group in Ann Arbor, published papers showing [AAT therapy provides] profound prophylactic effects." said Dr. Deeg. With this in mind, both the industry and academic players from this study are interested in expanding the applications of AAT therapy, Dr. Deeg explained, "The sponsor of our study is preparing a randomized trial comparing AAT + prednisone to prednisone alone as first line therapy. In addition I am working on a protocol for a pilot trial using AAT as an adjuvant in GVHD prophylaxis." This research not only expands the repertoire of tools for treating acute GVHD, but also emphasizes the importance of choosing the correct therapeutic application and regimen for new therapies. Funding for this research was provided by the National Institutes of Health; the Interleukin Foundation; Baxalta US, Inc.; Kamada; and Omni Bio Pharma. Marcondes AM, Hockenbery D, Lesnikova M, Dinarello CA, Woolfrey A, Gernsheimer T, Loghman-Adham M, Gelmont D, Storer B, Hansen JA, Deeg HJ. 2016. Response of Steroid-Refractory Acute GVHD to alpha1-Anti-Trypsin. Biol Blood Marrow Transplant. Epub ahead of print.